Simon Blockley, Professor of Quaternary Science at Royal Holloway, said, "It has been argued that abrupt climatic events may have caused a crash in Mesolithic populations in Northern Britain, but our study reveals, that at least in the case of the pioneering colonisers at Star Carr, early communities were able to cope with extreme and persistent climate events. "We found people were in fact far more affected by smaller, localised changes to their environment—Star Carr was once the site of an extensive lake and people lived around its edge. "Over time the lake gradually became shallower and boggier, turning into fenland which eventually forced settlers to abandon the area." Professor Nicky Milner, senior author based at the University of York, added, "Perhaps the later, more established community at Star Carr were buffered from the effects of the second extreme cooling event – which is likely to have caused exceptionally harsh winter conditions– by their continued access to a range of resources at the site including red deer. "We have been working at Star Carr for about 15 years and the site has produced an incredibly rare glimpse into the world of our Mesolithic ancestors who lived at the end of the ice age, about 11,000 years ago. "Putting this archaeological data into the context of the climate and environment is very exciting and shows that we need to keep an open mind when thinking about the effects of extreme climate on early populations." 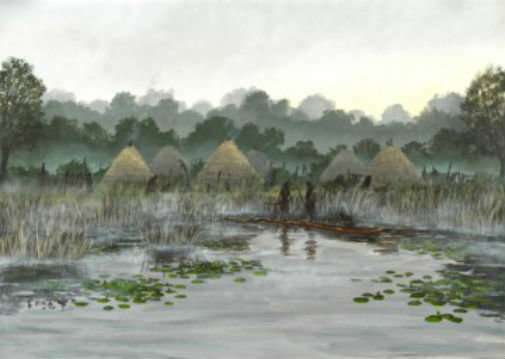 Duncan Wilson, Historic England's Chief Executive, said: "Star Carr is one of the best-known Mesolithic sites in Europe and is unique in Britain for the quantity and range of organic remains from this period. "We have been involved with funding and supporting fieldwork at Star Carr for over a decade, and thanks to studies like these we now have a much better understanding of people's resilience in the face of climate change 11,000 years ago." Humans are clever and adaptable. What a novel idea.